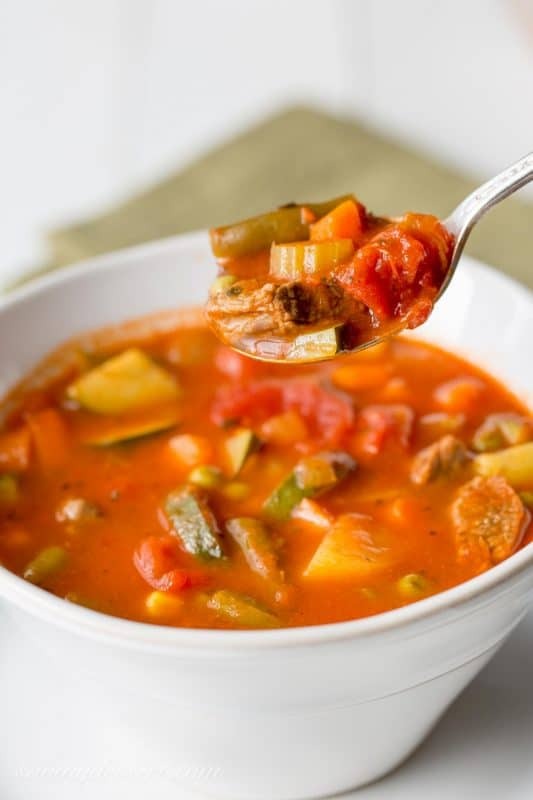 It’s January, snow is in the forecast for this weekend, and I’m in the mood for a giant pot of Homemade Vegetable Beef Soup! My mom always made soup while I was growing up. 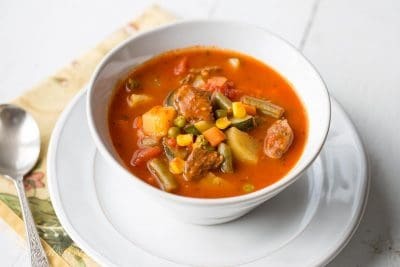 Mom kept a sealed container in the freezer and whenever she had a tiny bit of leftover vegetables or tomatoes, she would put it in the bucket and save it for the next time she made soup. Many years ago when I went out on my own, this was a recipe I had to have. I’ve tweaked it a bit over the years and think this is the best yet! This recipe makes A LOT of soup. Many freezer containers were filled and the crusty bread sliced. Yum! I cannot begin to count the times I’ve made this soup over the years. Each time it taste just a little different, but in a good way. The recipe is easily adaptable to whatever vegetables you have on hand. The broth is rich and tomatoey with plenty of herbs and flavor. A family favorite for years and years. It makes a lot of soup but freezes beautifully. Brown the chopped chuck roast in olive oil until browned on all sides. Add the garlic and sauté for a minute. Add canned tomatoes, soup and broths. Season to taste with all seasonings listed. Cover and simmer while preparing the fresh vegetables. Slice and cut celery, carrots, potatoes, onion and zucchini and add to meat. Simmer about 1 hour. 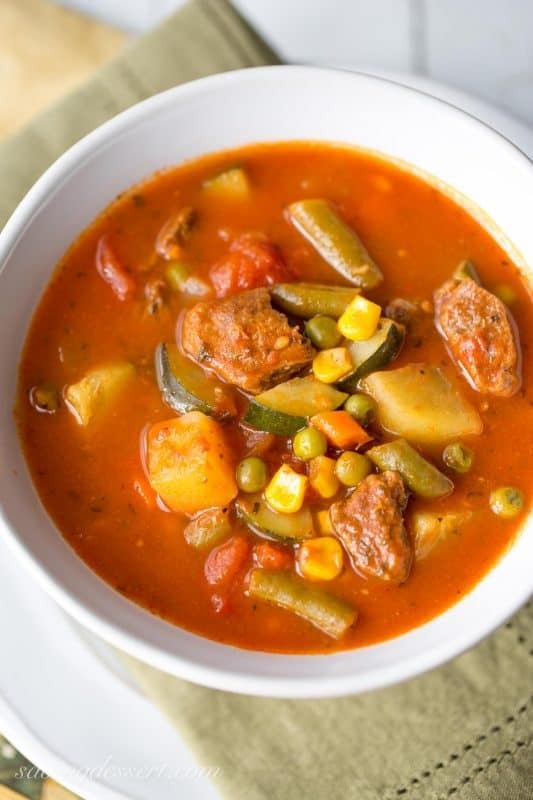 Stir in all frozen vegetables and simmer for 2 hours or until vegetables are cooked. Discard bay leaves and check the seasoning. 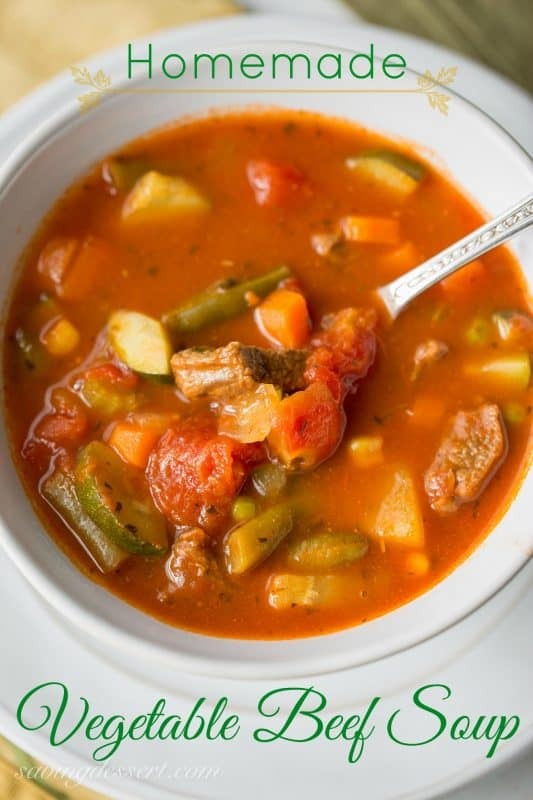 Homemade vegetable beef soup – finished product was fine , I was a little afraid it would taste too Italian, not so, but may use full body tomatoes and broth instead of the low salt next time. Love veggies so it was right up my alley! Thanks for the recipe! Hi Janice – I’ve updated the recipe to reflect the correct amounts. If you can’t buy cans in those exact amounts, I would just use what you can find. No worries – this is a pretty easy recipe that’s hard to mess up. Thanks! thanks for answering so prompt, I have it simmering right now. I like all the different ingredients in it, although I may leave out some of the spices next time, because I am thinking it is going to taste to Italian for my family. Everything else sounds great though! Have a great day! Thanks Janice – I wish I had a pot of this soup simmering away on the stove today! Enjoy and thanks again. No I haven’t tried that Sandra. I don’t think it would fit in my crock pot as it makes a lot of soup. This recipe is exactly what I was looking for, thank you! I would like to try cooking it in a crockpot/slowcooker…any suggestions on time and temperature? Thanks again! Hi Marisol. This recipe makes so much soup it won’t fit in a slow cooker. You would need two slow cookers or divide it in half and freeze some and cook some. I would still sauté the beef first and then cook on high for about 4 hours or until the potatoes are soft, or on low for 8 hours. My crockpot / slow cooker cooks much faster than many other brands, so you’ll need to adjust for your own temps as well. Good luck and thank you so much! In this recipe for Vegetable Beef Soup I wonder about the sizes of tomato cans, 15 oz or 32 oz? Hi Denise – sorry to be late in responding, we were traveling. Use 14.5 or 15 ounce cans. I’ll update the recipe – thanks for asking such a great question! 1. Our freezer space is limited. Is this something I could can in the pressure cooker? 2. Instead of canned diced tomatoes can I use fresh? Looks like some experimenting may be in order. Hi Veronica – I don’t think you can home-can anything with beef in it like this. I would check with the experts on this. I am not very knowledgeable about canning processes. Fresh tomatoes are fine to substitute! Enjoy and make variations as you want, it’s all good! How many people does the pot of vegetable beef soup feed? I’m having 7 people. Some may want seconds. Also, what kind of dessert would pair well with the soup? Hey Joyce! This soup feeds a lot. You will have plenty for 7-10 people to all have seconds – maybe thirds. I always freeze several containers – and it does freeze very well. No worries on having enough. Enjoy! Made this and my picky family LOVED it! Going to try it in the crockpot soon. Thank you!! Yeah! Thanks so much for letting me know. This has been one of our family favorites for years and years. Happy New Year Sara! How much beef broth and beef stock do I use for this? It varies sometimes due to the size of the roast, potatoes, etc. But as a starting point I would use one 32oz carton beef broth and one 26oz carton beef stock. Add water if it's still too thick, or use less broth in the beginning if it looks like way too much. The potatoes will swell and soak up some of the liquid, etc. Hope this helps and hope you love as much as we do! My mom always has a ziploc bag in the freezer which she uses to store her leftover vegetables that will go into her next pot of soup. So any leftover black-eyed peas or green beans (drained) get tossed into the same ziploc bag. Then when she makes vegetable soup she just throws in the whole bag!